The brand of dishwashing liquid Dawn Dish Soap, owned by Procter & Gamble, highlights, in its latest commercial, that “Dawn Cleans More Than Dishes”. 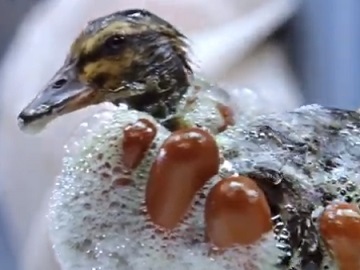 The 50-second spot opens with a wild duckling being grabbed by a rescue worker from a place affected by oil spills and being then washed with Dawn, which is a product “though on grease, yet gentle”. Other wild animals are also featured as they are washed with Dawn and freed to their natural habitat. The spot, set to a cover of Bill Withers’ 1972 single “Lean on Me”, ends with an onscreen line informing that “Dawn helps bring wildlife back to life”. For over 30 years, Dawn has been an important part of rescuing and releasing more than 75.000 wild animals affected by oil pollution. Thousands of bottles have been donated to wildlife rescue workers at The Marine Mammal Center and International Bird Rescue to use them for cleaning birds affected by oil. scents, original scents and natural scents.